Life in developing countries can be harsh on children, especially orphans, as they tend to face the most challenges and often struggle to survive. Nafisatu’s life as an orphan in Ghana has been more difficult than others. Nafisatu is the oldest of five siblings. When her father became ill, her family had to depend on the support of relatives who were just as poor. Nafisatu’s father eventually died from a stroke and left the family in a desperate situation. Nafisatu was just 16 years old. She left school thinking that she would be able to find a job to help her family, but instead became a street kid like so many other orphans. She describes this period of her life as a nightmare, “I was always scared that something would happen to me,” she explains. A friend told her about an organization that was offering free sewing classes and Nafisatu decided to look into this opportunity. She said that she almost wept when she saw the name “Zakat Foundation of America” and realized how her life could change. Alhamdulillah, not only was Nafisatu accepted into the sewing program and received training, but she also received a $50 monthly stipend to cover expenses. She says that after learning she was accepted into the sewing program, she wanted nothing more than to share this great news with her mother. 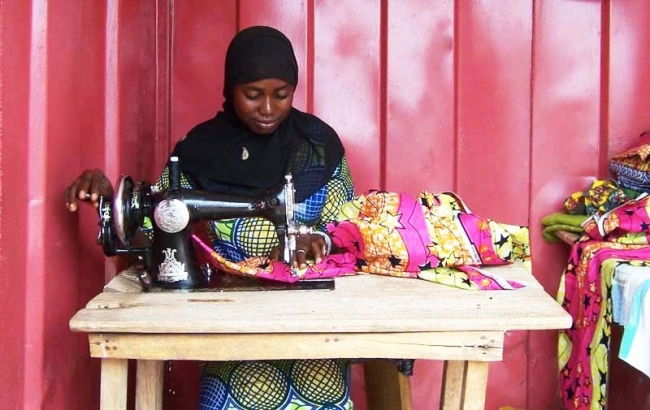 Nafisatu trained for six months on basic, intermediate, and advanced sewing skills. She passed the requisite exams, and after receiving her diploma, she was gifted a sewing machine from ZF to help her start her own business. Nafisatu’s sewing business grew to the point where she could rent a small shop that would not only support her mother, but also allowed her to marry and start her own family. Today, Nafisatu has two children and lives in the city of Kumasi, Ghana, where she operates her sewing shop. What started as a simple sewing class has changed her life for the better, Alhamdulillah. Imagine for only $50 a month for 6 months a life can easily be changed. Many young girls and single mothers are waiting to enroll in classes today. Please consider supporting training and education to empower the life of a woman forever! Any amount you are able to give is a great gift to these girls and women. Please rush your tax-deductible, zakat-eligible donation today to empower lives through your zakat and sadaqa. For more information, please call us at 1.888.ZAKAT.US or visit us online at zakat.org.